Curly hair care involves getting the perfect haircut for your curl type and knowing how to style and manage your hair to achieve its maximum potential. Hair cutting techniques for curly hair are very different from cutting techniques for straight hair. Cutting straight hair requires an accuracy and tension that predict where the hair will fall. When used on curly hair, the ‘S’ formation of the curl is overlooked. Traditional layering techniques cause the unwanted ledge – a mistake that could take years to grow out. Many curly hairstyles cut curly hair too short not allowing for shrinkage. The results are a drastic loss of blend and hair length which we call ‘cutting shock’. Cutting curly hair is the most complicated of all hairstyling procedures. The creative concept of cutting curly hair is all about understanding the correct distribution of bulk, where to eliminate the excess bulk to add volume movement and bounce, where to help enhance facial features or cover-up others and create easy to maintain fashionable hairstyles for all curly hair types. Before changing your long or short curly hairstyle try to examine the shape of your face. Take note of where the widest parts of your hair are, as these are the areas where you need the most volume control. Understanding the shape of your face, bone structure and profile will guide you to the right curly hairstyle. 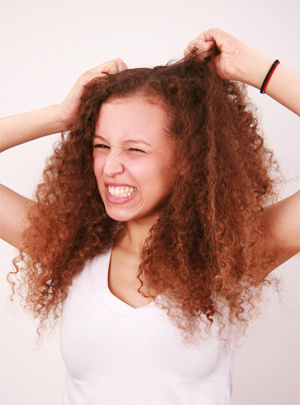 We all know it’s a challenge to find a great hairstylist, especially a ‘curly-savvy’ stylist. Start by booking a consultation with a recommended salon. It’s important to have a consultation with a hairstylist before deciding on any drastic changes to your curly hair, this will determine if your cut is a success or a failure. Having a consultation will allow you to ask the stylist about his/her cutting techniques and the stylists will get a sense of your ability to style and manage your own curls. Collect photos of people with similar curl types and identify what you like and dislike about their hairstyle. Pictures are a great way to help your hairstylist get a better understanding on the look you want to achieve and will help bridge the gap in communication during the consultation. 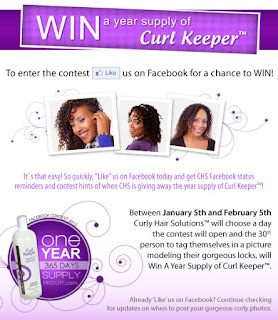 Back by popular demand, Win a Year Supply of Curl Keeper™ Facebook Contest will return starting January 2012. Over the past year Curly Hair Solutions™ has spoken to many of our fans on one-on-one bases and listened to all of our consumers informative responses and have truly seen the benefit of social media. If you haven’t already, please “Like” our Facebook group Curly Hair Solutions™ and become a fan! Be a part of our Curly Hair Solutions™ Facebook Community and ask curly hair questions, learn styling curly hair tips, post comments, browse our product line-up, find what type of products to use for your curly hair type, become a curly hair club member, win free prizes, enter CHS contests, and be informed about our new and exciting deals every month! To enter the contest ‘Like’ us on Facebook for a chance to Win A Year Supply of Curl Keeper™! It`s that easy! So quickly, “Like” us on Facebook today and get CHS Facebook status reminders and contest hints of when CHS is giving away the year supply of Curl Keeper™! Between January 5th and February 5th Curly Hair Solutions™ will choose a day the contest will open and the 30th person to tag themselves in a picture modeling their gorgeous naturally curly locks, will win A Year Supply of Curl Keeper™. If you “Like” us in Facebook already don’t worry you can still enter the contest. Just stay locked to our Facebook page everyday for hints and updates on when to post your gorgeous curly photos. The Winner will receive a 1 Year supply of Curl Keeper™.